The WV2213.BA0790 TAG Heuer Carrera Calibre 5 Men’s Watch is part of the latest additions to the Carrera line, and was recently debuted at the Basel Fair in Switzerland. A simple and classy watch with several style options not yet available to the public, this watch will definitely be popular when it is released in September of 2010. The TAG Heuer Carrera Calibre 5 is a straightforward watch with a strong touch of elegance. It offers buyers several style choices: the dial can be either black or silver, and both faces can be matched with either a 5-row fine-brushed and polished stainless steel bracelet or a black alligator strap. All of the indexes are fine-brushed and hand-applied with polished facets. Each hand is also polished have markers that are luminescent. There is a date window at the 4:30 position. There is also a sharp TAG Heuer logo at the 12 o’clock position. It is polished and set to protrude. The Carrera Calibre 5 also has a polished stainless steel case matched with a polished stainless steel bezel that is fixed to the case. It has a scratch resistant sapphire crystal on the front that is paired with the same type of crystal for the case back. 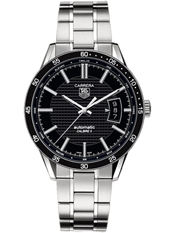 The crown is polished stainless steel and features the TAG Heuer logo on its face. The watch is water resistant to 50 meters.